Shifting beverage consumption patterns along with rising preference for low liquor content beverages are the key factor propelling non-alcoholic beer demand. Increasing health awareness among consumers towards the harmful effects of liquor coupled with changing lifestyle is expected to propel industry growth. 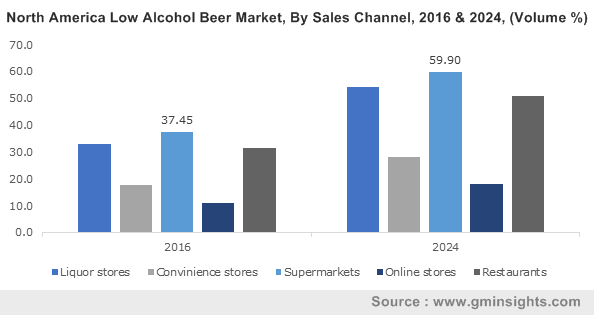 Considerable shift of young individuals to purchase a variety of alcohol free or low alcohol variants is expected to drive product penetration. As per Beveragedaily report 2016, several Middle Eastern countries allow liquor content in non-alcoholic beer to be 0.01% V/V. However, in EU this permit was around 0.5%. High economic growth coupled with increasing disposable incomes, particularly among the middle class population will positively impact industry growth. Strategies among liquor manufacturers to overcome social challenges such as forbidden liquor consumption in Islamic countries by introducing and launching alcohol free beers. The increasing popularity of these beverages in the Middle East is expected to offer lucrative opportunities to the industry manufacturers. Rising number of breweries introducing flavored low alcohol beer will significantly capture the untapped market. Rising government regulations pertaining to age limit for liquor consumption are expected to propel industry size. Low liquor content products are seeking popularity among underage youngster to have more beverage options will stimulate product demand. Moreover, consumer categories such as taxi drivers and pregnant women are majorly restricted from any type of alcoholic consumption, which will result in more demand for the alternatives. Several market players across the globe are undertaking R&D initiatives aimed at advancing techniques for the expansion and development of non-alcoholic beer market. Commercial feasibility and end-use usage of the product is the prime focus of these researchers. However, lack of standardization in product labelling and setting liquor content limit may restrict the industry growth. Non-alcoholic beer market will account for more than 50% of the industry share in 2016, increasing health consciousness and emergence to overcome inappropriate drinking habits will remain a key factor driving demand. These products contain 69 calories and less alcoholic percentage, i.e. < 0.05% ABV (Alcohol by Volume) as compared to other products. Rising promotional campaigns regarding open to all consumption of these products including pregnant women and sports athletes will foster industry expansion. Low alcoholic classifications were worth over USD 5 billion in 2016. Rising demand for these products owing to its content percentage, i.e. over 0-0.5% ABV will positively influence product penetration. Furthermore, increasing restriction pertaining to yeast strains activities to limit liquor content will encourage breweries to produce these products over the forecast timeframe. Hops are expected to observe a growth rate over 6.5% up to 2024. Increasing demand for the appropriate amount of flavours forming extra foam to enhance the creaminess in liquor products will remain a key factor driving hops demand. It helps to remove excess proteins in unfermented conditions and efficiently act as a natural preservative. Hop contains acids and oils that benefit in providing correct bitterness and aroma to the final product. Enzymes were valued more than USD 550 million in 2016. This material is a crucial component in beer processing for delivering better starch formulations and improving fermentable sugar conversion. Enhanced enzymatic supply and rising malt prices have further increased producer’s attention towards low calorie enzymatic liquor products. Surge in adoption of superior enzyme owing to better fermentation execution and high-quality beverage drink production will support enzymes demand in the non-alcoholic beer market. Dealcoholisation technology accounted for over 80% of the industry share in 2016. Reliable single pass liquor removal, using a stripping mechanism effective at low temperature and pressure are key benefits offered by this technology. Stripping efficiency is enhanced by regulating inside production vessel temperature before it is passed into the column. Additionally, limiting the requirement for recirculation further significantly reduces the overall operating costs and thereby, driving technology adoption in non-alcoholic beer production. The restricted fermentation technology is set to witness growth over 6% up to 2024. Benefits such as automatic restriction on ethanol production and limitation on extra yeast activity by adding specific strains controlling yeast contact time and temperature in the production vessel will propel demand. Liquor stores are projected to witness over 6.5% growth up to 2024. Presence of large number of product variety and is the key factor propelling indsutry share. Early consumer perception of beer product purchase from the liquor store is key factor boosting market demand. Moreover, supermarkets are making special shelfs and spaces for non-alcholic liquor segment thereby offering flexibility in terms of product comparision will strimulate growth in this segment. High avaliability of products along with various promotional discounts is anticpated to fuel product demand. Restaurants are expected to witness growth over 7.5% in terms of revenue. High consumer spending on dine in restaurants will benefit the industry growth. The segment already accounts for over 20% of the industry share in 2016. Europe non-alcoholic beer market accounted for more than 30% of the industry share in 2016. The strong presence of breweries and liquor manufacturers along with high adoption rate from consumers are major factors influenced the regional industry growth. Increasing commercial promotional activities including advertisements will boost market size. Promotions, advertisements and new product launch boosted product demand in the European countries. Germany, France, and Sweden are among the key contributors in the region. Asia Pacific non-alcoholic beer market size was over USD 1.5 billion in 2016. Strong economic growth coupled with rising purchasing power of middle-class population will remain a key factor driving regional industry growth. Major countries substantially contributing towards regional industry growth include China, India, Japan and South Korea. In a proportion of low alcohol and non-alcoholic beer launches in the key innovator market, China holds 29% of market share in 2016. In addition, rapid industrialization along with the emergence of new companies is expected to stimulate market penetration over the forecast timeframe. Non-alcoholic beer company market share is competitive in nature. Key industry participants include Heineken, Suntory, Bernard Brewery, Big Drop Brewing, Anheuser-Busch InBev SA, Krombacher Brauerei. Erdinger Weibbrau, Moscow Brewing company and Anheuser-Busch InBev. An increasing number of mergers & acquisitions along with joint ventures is expected to improve product development and strengthen global presence. Other prominent industry players are Carlsberg, Weihenstephan, Arpanoosh, Kirin, Behnoush Iran and Coors Brewing Company. Growing demand for free liquor content products in several Middle Eastern and Muslim countries as an susbtitutte to the islamic liquor ban is expected to boost industry expansion. Regulations regarding marking the products with halal tag is key factor maintained by the industry players with drinks to protect from any violation of the regional laws. Various industry players are increasing working on R&D projects towards product content development so that it can be substaincially sold without any legal or social restrictions. This is anticipated to further enhance the overall marketing and branding of the product.